Arts on 19th Street Celebrates Last Event on Nov. 5th! Good afternoon everyone, I hope you are having a wonderful day so far. Alex here to let you know that the Arts on 19th St. will be celebrating its last event in Tampa on November 5, 2011. You won&apos;t want to miss this event, so head on over to Singing Stone, on 8th Avenue in Historic Ybor City, f or the last Art on 19th St. on November 5th, from 11:00 am to 3:00 pm. 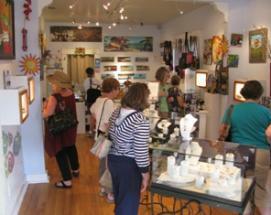 Art on 19th St. offers the chance to purchase one-of-a-kind hand-made art that was created on site. Many buyers have the ability to request custom pieces. Singing Stone has opened its doors to the local art community providing a free platform for emerging artists, crafters and musicians during Art on 19th St. Not only does the &apos;Casa de ART&apos; support 45+ local and regional award winning artists inside the gallery, but on the first Saturday of each month of the past year, they have invited artists to participate and have promoted local business participation. Each artist has demonstrated their medium during this live art event. Enjoy the rest of your day and check back with us often for more Tampa Bay Arts and Culture news.